Tonight Alive are a female fronted punk pop band from Australia fronted by the charismatic Jenna Mcdougal. Their first album was a fun collection of catchy pop punk songs, but lacked the attitude which was bubbling under the surface. 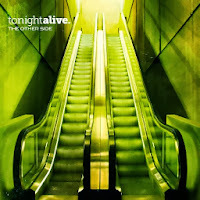 With this latest release, The Other Side (8.5), they have added more crunch to their sound with tracks like "The Ocean", "Lonely Girl" and "The Fire". The riffage adds a welcome dimension to their brilliant sound. Occasionally Jenna sounds like Hayley from Paramore; and sometimes Amy from Evanescence. The only disappointment is that the album does not contain the single "Breakdown", recorded with Benji Madden of Good Charlotte, maybe due to contractual difficulties. However, when they do explore their gentler side on the sublime titular track , "Bathwater" and "You Don't Owe Me Anything", the guitars are solidly chugging away, which stops it being too sweet. This is a solid release and explores a harder edged sound without alienating fans of their earlier releases. The band are poised to take the scene by storm. Expect to hear alot more.